DescriptionMarilyn Sheppard, four months pregnant and mother of a toddler son, was bludgeoned to death in her Bay Village, Ohio, home in the early morning of July 4, 1954. The cause of death was twenty-seven blows to the head with a heavy instrument. Who took her life so brutally has been the subject of much controversy and debate for nearly a half-century. Was it her husband, Dr. Sam Sheppard, who was convicted in what was then called “the Trial of the Century,” in the case that helped inspire the TV series and the movie The Fugitive? Or was the killer, as Dr. Sam claimed, a “bushy-haired intruder”? Or could it have been Richard Eberling, the window washer who worked for the family, as the Sheppards’ son, Sam Reese Sheppard, believes? Dr. Sam spent ten years in prison before the U.S. Supreme Court overturned the initial verdict in an important legal decision, determining that the doctor did not receive a fair trial due to excessive press coverage. 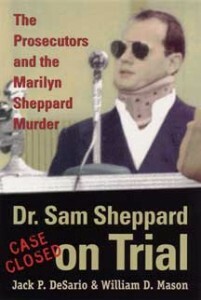 Defended by F. Lee Bailey in his second trial in Cleveland, Sheppard was found not guilty of his wife’s murder. And then in 2000, in what has been referred to as “the Retrial of the Century,” Sam Reese Sheppard attempted to prove in a civil trial, while suing the State of Ohio for millions of dollars, that his father had been wrongly incarcerated. AuthorsJack DeSario teaches political science at Mount Union College in Alliance, Ohio. William D. Mason is the former Cuyahoga County prosecutor.